MINI Malaysia has announced updates for its F60 MINI Countryman line-up in Malaysia, which sees the introduction of a new Cooper S Countryman Pure variant. Additionally, the Cooper S E Countryman All4 (the plug-in hybrid model) can now be had with a Wired Package, which includes an extended list of equipment. First up, the Cooper S Countryman Pure. In terms of pricing, the variant retails at RM228,888 on-the-road without insurance, making it RM20,000 cheaper than the higher-spec Cooper S Countryman Sports which you still can buy. For that money, you get a 2.0 litre turbocharged four-cylinder engine that makes 189 hp (192 PS) and 280 Nm of torque. An eight-speed Steptronic automatic transmission is paired with the engine, allowing for a zero to 100 km/h time of 7.4 seconds, and a top speed of 224 km/h. Standard equipment fitted to the Pure include LED headlights with cornering lights, 18-inch Black Pin Spoke wheels, Leather Cross Punch Carbon Black upholstery, Hazy Grey interior trim, two-zone automatic climate control, electric powered seats and a 6.5-inch touchscreen infotainment system. As for the Countryman PHEV, customers can now specify the Wired Package for an additional RM18,000 on top of the standard model’s RM250,888 price tag. Doing so will get you items such as 19-inch Edged Spoke wheels in place of the default MINI Yours Masterpiece units. On the inside, you’ll still get Leather Cross Punch Carbon Black upholstery, MINI Yours Illuminated interior and MINI Yours steering wheel. New additions include an 8.8-inch touchscreen infotainment system, a 12-speaker Harman Kardon sound system and a head-up display. There are no changes in terms of the powertrain, which consists of a 1.5 litre turbocharged three-cylinder petrol engine with 134 hp (136 PS) and 220 Nm of torque, which sends drive to the front wheels via a six-speed Steptronic automatic transmission. A rear-mounted electric motor (87 hp and 165 Nm) contributes to a total system output of 221 hp (224 PS) and 385 Nm. Performance-wise, the century sprint takes 6.8 seconds, while the top speed is 198 km/h. 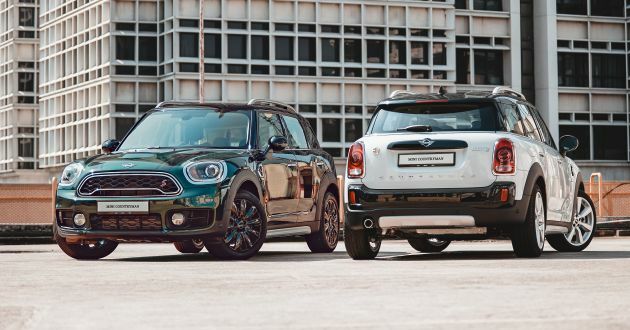 Both cars come as standard with the MINI Connected with built-in 4G SIM connectivity and a range of services like Intelligent Emergency Call, TeleServices, MINI Online, MINI Concierge Service, the wireless Apple CarPlay, Remote Services and eDrive Services (for the Countryman PHEV). Also included are Comfort Access, Park Assist, front and rear Park Distance Control, powered tailgate, rear-view camera and the MINI Picnic Bench. Without advance driving safety system (even the most basic autonomous breaking system), it seems the growth of consumerism for Malaysia automobile is still very behind! This, profit greedy company such as BMW/MINI Malaysia and Mercedes Malaysia continue to exploit their customers. Previous Post: AD: Euromobil announces special service campaign for grey import Audi owners – full benefits included!